(A Finn T60 is 600 gallons. A TurfMaker® 550 is 550 gallons). Save an hour on a job requiring 20 bags of mulch with a TurfMaker®. You can load 4 bags of Flexterra® into a TurfMaker® 550 and go to work. You can load 3 bags in a Finn T60. With 4 bags in the tank instead of 3, it takes only 3 tank loads instead of 4 to apply the same amount of mulch. Load each tank load faster. Save as much as an hour on the job requiring 20 bags of mulch. Make the call yourself. And then ask how long it takes to load and mix the tank. Ask a Finn T60 owner how much Flexterra® he loads per tank load. You will likely get the answer, “3 bags per tank load”. Make the call. Get the answers for yourself. Also ask how long it takes to load and mix the tank. The precision 2” steel gear pump manufactured by TurfMaker® handles thick slurries much better than traditional centrifugal pumps. Entrapped air or pump cavitations just don’t occur with a TurfMaker® pump. The pump just chugs along at a very slow RPM and delivers thick mulch slurries with extreme power and without clogging. 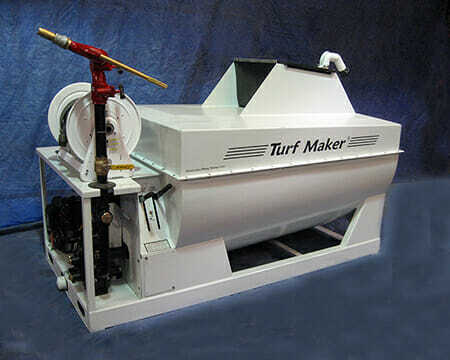 A TurfMaker® with hydraulics can also run the pump backwards. It is so easy to remove any kind of stoppage by simply hitting reverse for a moment. NO CLOGGING IS REALLY NICE. The T60 has a centrifugal pump engaged with an electric clutch (not hydraulics). This pump will not run backwards to clear a clog. It is not uncommon for Finn operators to partially disassemble a Finn machine at a job site to undo a clog. A Clog is a miserable time killer! TurfMaker® machines are known for pumping thick mulch slurries through long hoses. Pumping a 4 bag mix of Flexterra® through 300 or even 400 feet is powerful pumping. Both the Finn and the TurfMaker® hydraulic machines have reversible agitation. Reversible agitation is useful if a large piece of mulch jams the agitator. This most often occurs with a weak hydraulic system. A second issue is that if too much water is put into the tank before all the mulch is loaded, mulch will float on top of the water. Reversing the agitator can pull the floating mulch into the solution and get it mixed.